What exactly is Idle No More? Conceived in November by four Saskatchewan women frustrated with the Tories’ latest omnibus budget bill, Idle No More is a First Nations protest movement looking to obtain renewed government guarantees for treaty agreements and halt what organizers see as a legislative erosion of First Nations rights. The movement’s most visible spokeswoman is Theresa Spence, chief of the Attawapiskat First Nation, the Northern Ontario reserve struck by an emergency housing crisis last year. Since Dec. 11, Ms. Spence has been on a hunger strike while camped on an Ottawa River island only a few hundred metres from Parliament Hill, vowing not to eat until she has secured a meeting with Prime Minister Stephen Harper. 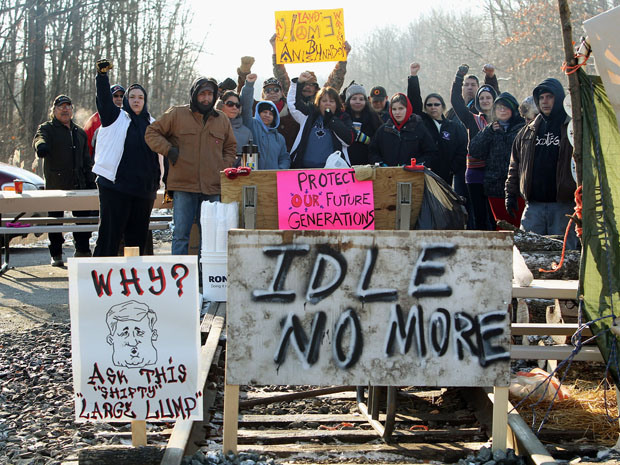 Since early December, protests spurred by Idle No More have included a 1,000-person demonstration on Parliament Hill last week, a blockade of a CN rail spur near Sarnia that continued for a sixth day on Wednesday and a variety of brief demonstrations and blockades across Canada and parts of the United States. Although Idle No More trended on social media over the holidays, has there been much non-virtual movement of late? Protests largely quieted down over Christmas, although on Boxing Day scattered demonstrations were seen at malls in the Prairie provinces, Sarnia remains blockaded and Theresa Spence still has not eaten. On Wednesday, Ms. Spence received endorsements from the two frontrunners in the Liberal leadership race, Marc Garneau and Justin Trudeau. Mr. Trudeau met with Ms. Spence in her Victoria Island teepee, while Mr. Garneau released a letter calling for Mr. Harper to build “renewed understanding” with Canada’s First Nations. The crux of the protest is ensuring that treaty rights are respected. Are treaty rights being disrespected? 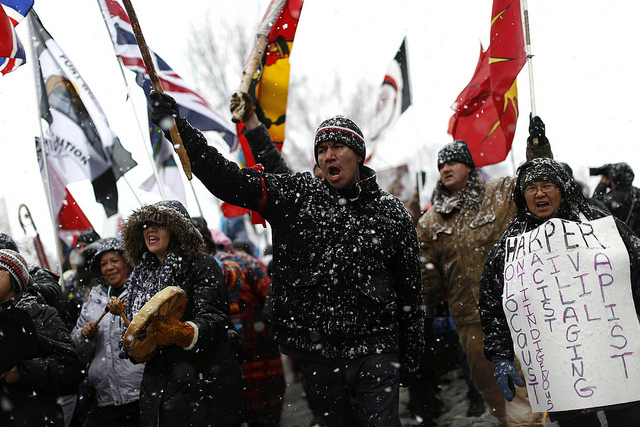 How wide is support for the protests among Canada’s First Nations? Not all First Nations protests are created equal. In the past, several high-profile demonstrations such as the 2007 blockade of Ontario’s Highway 401 or Aboriginal protests surrounding the 2010 Vancouver Olympics were conducted by fringe groups with little or no official ties to the groups they claimed to represent. Idle No More’s protests, on the other hand, have received the official backing of First Nations groups and leaders across Canada, including Assembly of First Nations grand chief Shawn Atleo, who has often been noted for advocating close co-operation between Aboriginals and the Tory government. Responses to "How the Idle No More movement started and where it might go from here"
Its about time that they all got together and let them know that the Natives Indians were there first, and they have to respect the Treaties, Number 9 Treaty, and all the Treaties. Large Corporations, can't come and disrespect them and take what they want. Also, They can't come and attack their Woman, and Children but their protesting against something thats rightfully belongs to the Native Indians. The Land and the Oil, and your Rights for Natives to make their own decisions. Its their path to a Free Society for the Natives. We the Native Indians here in the United States, support you, and while I know that I'm not in Canada, I started protected the Natives here in USA back in 2008, however it only takes one man or woman to start it. And then the Nation will follow, God Bless! Be Peaceful but tell large Corporation you mean business. As Native Americans, First Nations people, we are not the immigrants. We are the oppressed ruled by the immigrants that came and took the land, the rivers, the lives and now think that we are second class people. That we need to assimilate, give up our languages and culture so we are no more. We were killed and put on reservations while immigrants from afar were welcomed to our lands. Immigrants from other countries are encourage to keep their languages, culture, and looked upon as intelligent. Something has been wrong for so many years, wouldn't you say? I have been doing a lot of reading on this matter and find one common thread in every report, lack of specific examples of the allegations that are being opposed. Lots of details of each protest, lots of pictures and video of people with placards but no stories or examples of treaty violations or how the omnibus is directly affecting people now. I feel the majority of Canadians are misinformed as to how our taxes support native people's and reserve lands so there isn't much empathy with protests. My basic impression is that native leaders receive huge amounts of money to run reserves but all the problems on a reserve are blamed on the federal government and not on the local reserve government. Tell us your stories, provide exact details, open your books, name the names of who said what and when, then we can decide if we want to back your protest. Anyone near the Sarnia protest can you go to the location and help!! As far as how I feel it seems to always come to one groups rights their are other peoples rights involved as well. Their was wrong doing on both sides of this only thing is people only see one side . All reservations should be abolished it is a part of segregation that should not be . all should be together remember we are all one and are all connected it doesn't matter who you are. and also for some to have their rights what about others rights I didn't do the deed way back in history and sorry but don't feel it should keep coming off my back when I can barely take care of my family your schooling is paid for others have to go into debt just to send their children to school. In no matter way shape or form if you look at things no bodys rights are being honored. As far as these lands go they don't belong to anyone they belong to everyone on this earth until we leave it and the creator takes it back . Gets right down to this we are all the same no one is different from the next everyone can have their cultures and language that should be respected by everyone that is just common courtesy and how it should be. It is really time for all of man kind to learn to live together as one and to all be equal no one group is more special than the other no race is better than the others no religion is better than the others and if humanity can't sit down and figure this out and come together and live in peace with one another WE ARE ALL BROTHERS AND SISTERS IN THE HUMAN RACE AS IT WAS MEANT TO BE . No one is better than the rest we should all follow the same laws we should all live together we should all help each other we should all respect each other end of story. We need the facts...not rhetoric. This grass roots movement is very necessary and i fully support it. The government needs a tune up, but so do some of the FN governments...corruption is not color coated. This is what the FN women and young are telling us. So a $100million was spent in Attawapiskat in the last number of years... peanuts when you have to look after health, education, housing etc. But the leaders and bureaucrats from all governments need to look after the people...not only themselves. Why should anyone in this rich country live in the housing we have seen of FN reserves? It is a disgrace to our homeland for which we are all here to share and protect.